With more than 38 years in the heating and cooling business and 18 years in our Generator Division, we are dedicated to providing the best possible total indoor/ outdoor weather solution for you and your family. You can count on us to provide you with a system and solution that fits your family’s unique needs. And since we’ve installed many indoor weather systems in Northwest Indiana and Illinois, we’ve earned a reputation for doing the job right the first time. 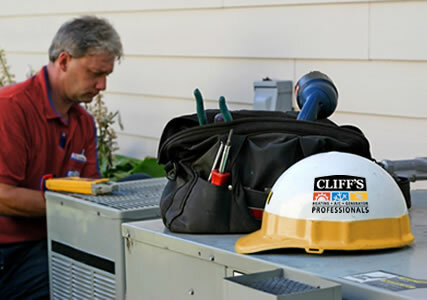 Cliff’s is your expert contractor for HVAC, heating, air conditioning, cooling, generator and thermostat installation and repair for residential and commercial systems in Schererville, Highland, Griffith, Dyer, Munster, St. John, Valparaiso and other Lake County and Porter County communities in Northwest Indiana. Cliff’s will continuously strive to provide the highest quality products and services, at a Value that will deliver both customer satisfaction and loyalty, all of which will set Cliff’s apart as the Premier Home Comfort Services provider. At Cliff’s we have always believed that we cannot provide quality service without employing quality people. Our employees are certified by N.A.T.E. (North American Technician Excellence) as Air Conditioning – ACE Service Technicians. Additionally, our technicians attend and complete numerous factory-sponsored training seminars. As a York CCE Dealer, Cliff’s is able to provide superior service with the backing of one of the best names in the heating & air conditioning industry. Recognizing that we are a small business, our membership with N.F.I.B. enables us to voice our opinion on matters that directly affect everyday consumers of our goods and services. The community is our marketplace; therefore, our membership in the Schererville Chamber of Commerce is a must. Cliff’s has been a member in good standing since we built our facility in Schererville. 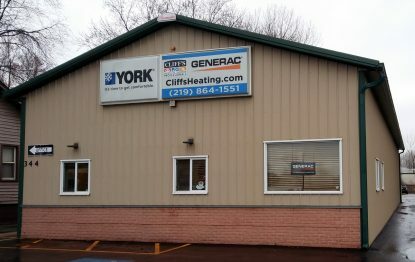 Cliff’s was founded in 1979 by Clifford Purnell, Sr., as a small service shop that served both the residential and light commercial heating, air conditioning, and refrigeration markets. Over the years, Cliff’s has grown to serve customers in over 42 cities across the Illinois and Northwest Indiana markets. In 2000, Cliff Sr. welcomed his son, Cliff Jr., into the operation, as a move to guarantee the tradition of superior service established years earlier. Cliff Jr. brought both new energy and fresh ideas into the company. In 2002, Cliff’s constructed a new office/warehouse facility at our current location in Schererville. This expansion allowed us to consolidate our HVAC and back-up power generation products under one roof. Additionally, it will allow us to transition into a Premier Home Comfort Services Provider. Residential HVAC servicing and replacement still comprises over 90% of our business. Our craftsmen are trained and certified by N.A.T.E. and our major suppliers. First, to assure your satisfaction, we start by asking questions. If we don’t provide what you need and want, we’re not doing our job. Second, we work with the leader in home heating cooling equipment, York. Finally, we provide quick, professional service and complete service plans to keep your systems operating at peak efficiency. It’s all part of our tradition of service — assuring your complete satisfaction. We service all makes and models of heating, refrigeration and air conditioning units! "We have always experienced friendly, expert and professional service from anyone who came to our home on behalf of Cliff's. We are confident that we are receiving the best service possible."